A Complete Guide with a Focus on Mining Stocks. Click here to join our FREE mailing list and receive a free chapter called "How to Value Mining Stocks"
Out for the Kindle on Amazon and Nook on Barnes and Noble. The print version will be out in May or June. This release has 40 more pages and is 270 pages long. It includes 350 companies in the stock lists (although the stock lists are not included in the digital versions). The digital version is only $4.99. This is an excellent book for those interested in precious metals investing, especially for mining stocks. Want to invest in gold and silver, but aren’t sure how? 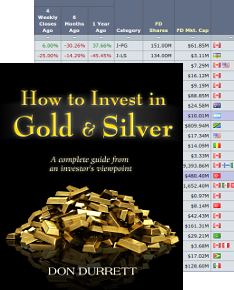 How to Invest in Gold and Silver is a practical guide for investors who are new to the emerging gold and silver markets. Written in clear layman’s terms, this forward-thinking book is packed with information to help gold and silver investors navigate an exciting, timely and largely unexplored market. An overview that explains the wisdom of gold and silver investments in today’s economic environment. Indispensible information on how to manage the risk of gold and silver assets. A step-by-step strategy to investing in bullion and coins. Clear explanations on using ETFs (Exchange Traded Funds) and options. The pros and cons of investing in major, mid-tier and junior mining companies – and a how-to methodology for making informed choices for the best gains. 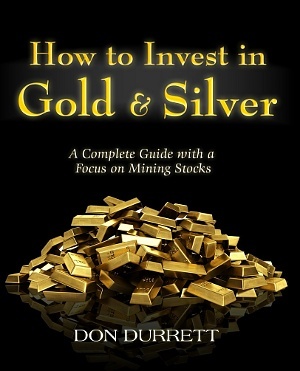 In his pioneering work, author Don Durrett shares the details of his own systematic, successful approach to investing in gold and silver. This easy to follow book shows investors how to take advantage of the rising prices of precious metals using a balanced portfolio of gold and silver assets. Armed with this knowledge you will be able to invest with confidence. "Whether you are an individual investor or a professional wanting to learn how to invest in the precious metals sector this is the right book at the right time. Don takes you through the basics of investing in bullion or stocks; from large cap producers to junior exploration companies. Must reading for those wishing to familiarize themselves with the intricacies of precious metals investing." "...the book, which in my estimation is a Bible-equivalent for junior resource investors, aggregates the small details investors need to know in order to survive in the junior resource market."